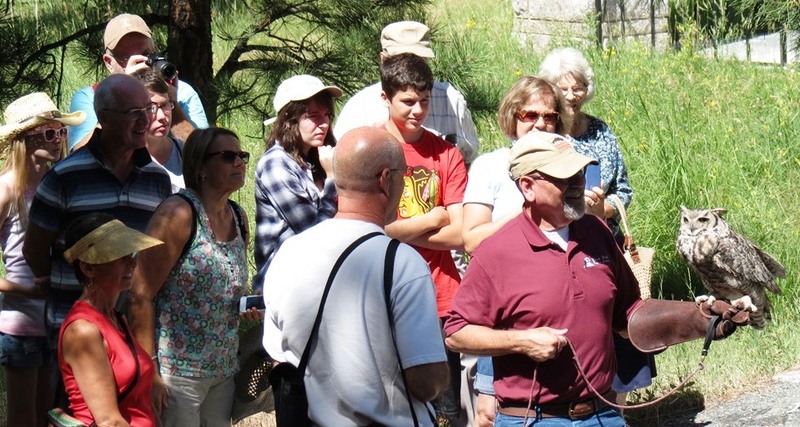 Steve Benn with Phoenix (a Ferruginous Hawk), Betty Jo Huff with Wolfie (Big Bad Wolf is an Eastern Screech Owl — gray phase), and Maggie Engler with Elise (a Red-Tailed Hawk) at Mount Rushmore in July, 2014. The life work of Elise, a magnificent red-tailed hawk, is to soar over the grasslands searching for mice, voles, garter snakes and other food so her species can live. Maggie Engler’s job is to help you and me understand how much Elise’s life means to ours. Maggie and her co-founder John Halverson have created the Black Hills Raptor Center to help birds of prey like Elise survive and recover from human-caused damage. The center is allowed to house only birds that can never be released into the wild. Because these birds can no longer hunt to live, they help BHRC educate us about the birds of prey — raptors — whose life work of rodent control coincidentally protects our food supply. If you eat grain in any form, you have dined on mouse waste. Mice eat wheat, corn, oats, rye, barley and other grains humans use in cereals, bread, pasta, grits, tortillas– and beer. Because they don’t see well, mice mark every step of their journeys with urine and excrement, so they are able to sniff their way home. In one year, a pair of mice can produce 908,544 offspring. Each pair of mice that lives one year will eat 8 pounds of grain between them, and spread their filth in another 22 pounds. Birds of prey– eagles, hawks, falcons and owls– contribute enormously to mankind’s welfare, besides being charismatic megafauna with majesty, power, and grace. Eighty percent of these birds, so vital to human interests, die before they are a year old. Volunteer Steve Benn allows people to see Icarus, a Great Horned Owl, up close at an educational program. Maggie and other volunteers introduce the BHRC birds to the public in 160-170 programs a year for preschool through college classes, community groups, visitors to national and state parks, conservation camps, outdoor expos, and sports shows in and around South and North Dakota. Trained as a naturalist, interpreter, and environmental educator, Maggie holds a B.S. in Natural Resource Management from the University of Wisconsin-Stevens Point, and has done this work for thirty years in various capacities. Like the abused birds she has rescued, she has known enough troubled times to identify with the hardships humans have caused the birds. Maggie also teaches preschool, and tutors people with dyslexia. In her “spare” time she takes care of the other raptors, handles correspondence for BHRC, communicates with volunteers, and writes grants. Maggie, John and the volunteers do all this public education without a building that the public can visit to see the birds and contribute to their welfare. Her vision of the nonprofit Black Hills Raptor Center is three-fold, with the birds of prey serving the first goal of educating people about the natural world. In the future, Maggie hopes that the center will rehabilitate injured raptors, returning them to live out their lives as wild animals and take their necessary place in the food chain. “We can’t do rehab because we don’t have the space to construct the necessary enclosures,” explains Maggie. Science has not proven that rehabilitating common species, such as great horned owls or red-tailed hawks, does anything to impact the local population for the good, but rehab connects with the minds and hearts of people who learn to care about these wild birds. The center also hopes to participate in research expanding scientific understanding of the role of raptors in the environment. South Dakota is home to seventeen species of daytime (diurnal) raptors including two species of eagles, bald and golden; one of vultures, the turkey vulture; the osprey, and five kinds of hawks, red-tailed, ferruginous, Swainson’s, broad-winged and rough-legged, as well as five of the North American falcons, the American kestrel, merlin, prairie falcon, peregrine falcon and gyrfalcon. South Dakota’s raptor riches continue; the state is home to all three of the North American accipiters (hawks with short, broad wings and long legs particularly suited to fast flight in wooded areas): the northern goshawk, Cooper’s hawk and sharp-shinned hawk, as well as nine species of nighttime (nocturnal) raptors: great horned, eastern screech, burrowing, long-eared, short-eared, northern saw-whet, flammulated, barn and snowy owls. Currently, Maggie and her co-founder John Halverson house the birds at their homes. “John is awakened at sunrise every morning from March until June by a male kestrel shrieking for a mate,” says Maggie. “He needs to get some sleep.” At John’s house, Hendrix can have the supplemental heat he needs to survive in winter. 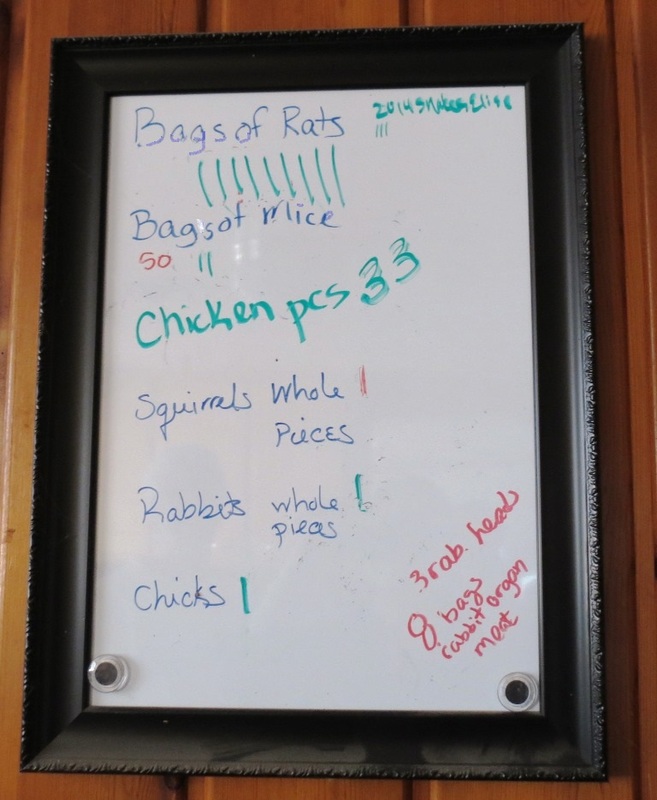 Maggie keeps track of the rats, mice, rabbits and other tasty bird-food stored in her refrigerator and freezer. After four years of gutting rats and mice for raptor food on her kitchen counter, Maggie is looking forward to 2015. The National Guard and Job Corps are cooperating on plans to build a center to house the birds. A local construction company will manage the project, and has completed drawings for the building, to be placed on land leased to BHRC for 99 years with an automatic 99-year renewal. Designed to U.S. Fish and Wildlife requirements, the center and its grounds will be open to the public. The expertise to create the center is in place, but BHRC needs to raise enough money before spring to buy building materials. A professional fundraiser has offered to teach the Center’s board how to conduct a capital campaign during the coming months. The new building will generously expand the services BHRC is able to offer, including adding one or both species of eagles as avian ambassadors. “Everyone wants to see an eagle,” Maggie explains, but the birds cannot be kept, even for educational purposes, at any site not open to the public. Moreover, the building will allow volunteers to begin rehabilitating raptors for release into the wild. With a location where the public can actually see and participate in raptor care, BHRC will draw more community support, volunteers and donations. Current BHRC sponsors include Reptile Gardens; the National Fish and Wildlife Foundation; Black Hills Corporation, a diversified electric and gas utility company in Wyoming and South Dakota; and McPherson Auction and Realty. And Icarus works for her keep even when she’s not appearing in classrooms; her sterilized pellets provide a hands-on guide to what a great horned owl eats, and are available for $1 each. Money isn’t the only way to help the Raptor Center. The website (www.BlackHillsRaptorCenter.org) provides an ever-changing wish list of items needed, currently including hand tools, garden hose, postage stamps, bleach, detergent, a weed whacker and boxes of sandwich baggies used to store meat processed for bird food. In addition to voluntary contributions, the Center has recently received money collected as fines from individuals who broke federal law by killing raptors. Maggie, herself a hunter, says that while raptors do eat pheasants, grouse, ducks and geese, the hunting is not enough to damage a healthy population. A golden eagle may take a lamb, but most of its diet is ground squirrels, rabbits, and prairie dogs. When raptors are intentionally killed, the human population loses the best mouse traps in the world, and a predator that has evolved to keep populations of prey animals within the carrying capacity of the local environment. Now, thanks to the current USFWS agent for the western Dakotas, the fines imposed on raptor-killers will help the populations of the birds they slaughtered. For several years, restitution paid by poachers of raptors has gone into the Dakota Eagle Restitution Fund. Rehabbers could apply for these funds for help in raptor rehab efforts; BHRC recently applied and was granted some of these funds. In addition, two recent cases were adjudicated so that the restitution was paid directly to the BHRC to assist in construction costs. More than a hundred people a year ask BHRC for help with an injured bird, but all Maggie can do now is assess each bird’s condition before taking it to a facility with the necessary permits to provide medical care. The closest permitted facilities are in Sioux Falls or Watertown in South Dakota, and Cody, Wyoming. Many injured birds don’t live long enough to reach help. 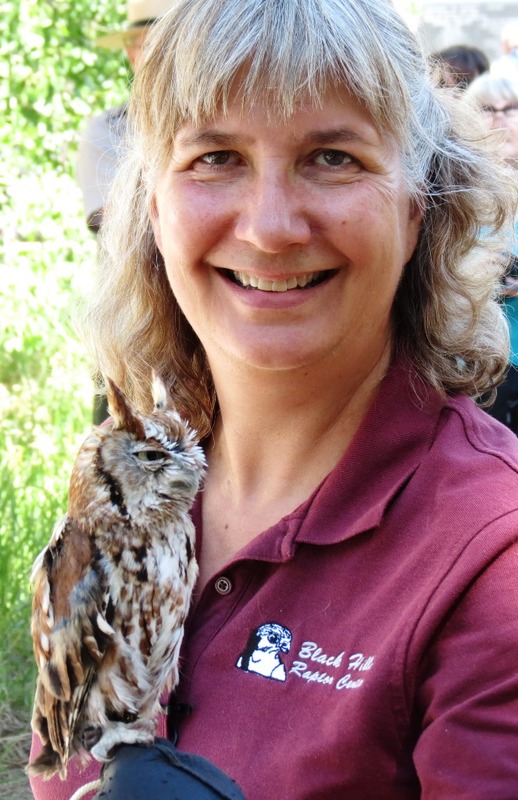 Maggie Engler with Little Red Riding Hoot, an eastern Screech Owl (red color phase). While the new facility will focus on raptors, it will also be able to provide educational programs such as a bird banding lab, birding classes, kids’ summer camps, and bird feeder and bird-house building events. Exam rooms, labs, radiology, an Intensive Care Unit and surgical suites will allow BHRC to treat injured birds. The center will finally be able to house birds that require heat to survive the winter. Cold storage will allow Maggie to get the rat refrigerator out of her kitchen. A large oval space, covered with netting as protection against aerial predators, will allow birds to practice flying before being released. The building be built to passive solar specifications; Maggie hopes to live on the land as well. “Mouse school” will enable the birds to learn to hunt so they can survive in the wild. In these mews—bird enclosures–the lower walls will be encased in sheet metal so that live mice released into the rooms cannot escape. In this way, the birds will learn to kill their own food, never seeing the humans who deliver it, and thus be kept from associating food with people—the imprinting that ruined Elise for life in the wild. How much does it cost to feed a raptor for a day? Little Red Riding Hoot, who weighs about five ounces, can eat up to three mice a day in the coldest winter months at one ounce each, or 60 percent of her body weight. Unfortunately, wild caught mice are not an option since they might carry disease or poison that would kill the educational birds. One domestic mouse costs 95 cents. If Hoot eats 3 mice daily for a cost of $2.85 during 60 days of winter, that winter diet costs $171. If she eats two mice a day for the rest of the year (305 days) her total year’s food bill is $750.50 for 790 mice. As a comparison, John explains that he weighs 160 pounds and loves homemade macaroni and cheese. But in order to eat in proportion to Hoot’s dietary requirements, he’d have to eat 96 pounds of macaroni every day. Food for all six raptors at BHRC totals about $282 a month, or around $3,384 per year. Maggie and John are not alone in their attempts to rescue raptors; a dozen or more volunteers from this area regularly offer help of various kinds. Rabbit breeders at the Central States Fair, for example, often donate unsold rabbits to BHRC for raptor food. One woman was so horrified at the idea that she bought several rabbits to save their lives– until Maggie explained the raptors’ need. Now that the woman understands the importance of feeding the birds and the convenience of using unwanted rabbits, she contributes to the BHRC in several ways. No central clearinghouse for information on wildlife rescuers exists, but the National Wildlife Rehabilitators Association (http://www.nwrawildlife.org/) estimates that 75% of the hundreds of thousands of animals cared for are affected, almost always negatively, by human activities. The Black Hills Raptor Center will finally offer South Dakota citizens an opportunity to apologize for that human damage by helping individual birds of prey. 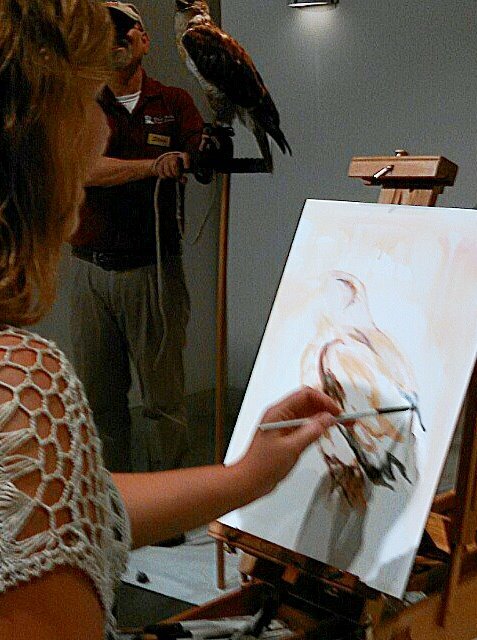 An artist painting Phoenix the Ferruginous Hawk. I wrote this story in September, 2014, to help publicize the BHRC annual “Art on the Wing” fundraiser, held at the Dahl Arts Center in Rapid City. Artists have to “wing it” during the event, going from blank canvas to finished artwork in 90 minutes while an interested public watches over their shoulders. At day’s end, the new art was sold at auction to benefit BHRC’s capital campaign to build a permanent facility. Besides Elise, the artists observed Phoenix the ferruginous hawk, Icarus the great horned owl, Hendrix the American kestrel, and two Eastern screech owls, Little Red Riding Hoot and Big Bad Wolf. Artists who attended the 2014 event included: Jim Green, sculptor; Petty Detmers, sculptor; Bob York, western artist; Rae Schneider, colored pencil sketches; Terry McTighe, painter; Tommie Leenknecht, painter; DeDe Farrar, painter; Shaila Peterson, painter; Jackie Kreibel, painter; Mary Jo Marcy, mixed media; Jim Hatzell, sketches and Laine Golliher, sculptor.